(Newser) – Kevin Curran might not have been a household name, but there were few Americans he didn't get a laugh out of during a decades-long career in TV comedy writing and producing. 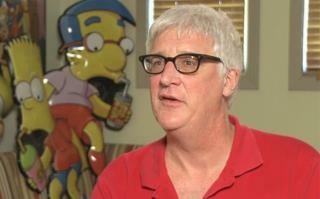 Curran, a six-time Emmy winner who has died from complications from cancer at the age of 59, joined the producing team of The Simpsons in 2001 and wrote a dozen episodes, Deadline reports. He won three of his Emmys with The Simpsons and three with Late Night With David Letterman, where he was part of the writing team from 1985 to 1987, reports Variety. He came up with the show's first Top Ten list: "'Top Ten Words That Almost Rhyme with ‘Peas.'" Sad news. Thanks for that Top 10 clip, Newser. That was nice.